The Voice – II Cor. 3:18 Now all of us, with our faces unveiled, reflect the glory of the Lord as if we are mirrors; and so we are being transformed, metamorphosed, into His same image from one radiance of glory to another, just as the Spirit of the Lord accomplishes it. The Amplified Bible – II Cor. 3:18 And all of us, as with unveiled face, [because we] continued to behold [in the Word of God] as in a mirror the glory of the Lord, are constantly being transfigured into His very own image in ever increasing splendor and from one degree of glory to another; [for this comes] from the Lord [Who is] the Spirit. Have you ever been in church and the pastor is preaching and after awhile it occurs to you that the whole sermon seems to be directed at one particular person’s situation? It’s almost embarrassing. It’s like everyone knows the minister is referring to Dan or Shirley or Marg or Jason, so why doesn’t he just go all the way and use their names? But then, mysteriously, you’re drawn into a long conversation with Dan, Shirley, Marg or Jason a few weeks later, and you get the distinct impression that the sermon hasn’t changed a thing in their life; that whatever it was that made it so blatant to you and everyone else that it was about them, seems to have misfired or otherwise not taken root. The Bible tells us we’re not simply to be hearers of the word, but doers of the word; but sometimes we mess up the hearing part which cancels out the rest. Imagine not knowing what you look like. People do this everyday however. The middle aged man steps into his souped up sports car, turns the music on the sound system up high, and believes he is still 18. He starts flirting with his assistant at work and with the receptionist at the dentist’s office, and forgets he’s graying; that he has a wife and kids. The woman who goes out to lunch to with four friends and then spontaneously offers to pick the tab for everyone’s meal before they embark on an afternoon of shopping, slapping down the credit card at store after store, forgetting that the bank has already canceled her other credit card because of too many missed payments, and her income prospects for the foreseeable future are rather dim. We all need a mirror. An accurate one. One that doesn’t distort the truth. The clearest, most focused mirror is God’s word. It shows us what right living looks like. It tells us where we’ve messed up. What we can do to get back on track. What it will take for us to stay on track. You can read more about this four-fold purpose of scripture by clicking here. Sometimes the sermon is about you. It’s like there’s no one else there. …Now then, imagine the same scenario, but it’s more like a bad dream. The pastor preaches a similar sermon, but everyone turns around stares directly at you. But weeks later your life is unchanged. What would your excuse be? A few days ago at Thinking Out Loud, I wrote a post called “We’re All Afraid,” and noticed that many of our modern worship songs involve our need to cast our worries and anxieties on God, and that many of these songs are being sung at this particular time in the United States, where weather disasters and gun violence seem a constant threat. You can read that post here, and click through to listen to the songs. Then I discovered that in addition to BibleGateway.com tracking our verse requests, it’s possible to find out which Bible verses are the most highlighted on eReaders. This appeared on Joel J. Miller‘s blog, and as always, C201 readers are encouraged to read items by other authors at source; this one was titled The Secret Behind The Bible’s Most Highlighted Verse. It’s no scientific survey, admittedly, but it seems telling that the most underlined passage in the most underlined book addresses worry, doubt, and disquiet. Maybe we have a problem with anxiety out there. I know I have one in here. The passage is a favorite because it offers something for us to do with our worries. We’re directed to take them to the throne of God, and I’m sure that works for some. But the truth is that it’s not a complete answer to our problem. If we read the simple admonition, it’s easy to see Paul as some sort of Bob Newhart character yelling, “Stop it!” But before you think I’m being flip, let me redirect the blame to the people who first invented our scripture notation system. Paul obviously did not insert the chapter and verse numbers in his letters as he wrote; scholars in the thirteenth and sixteenth centuries did that. And while this system has its merits, it also creates problems, including accidentally altering the meanings of certain passages — or at least the meanings we take from them. Paul’s statement is not merely a blunt admonition (don’t do it). It actually comes with comes with a rationale (you don’t need to do it because…). But the rationale is one we might miss because of the verse numbering. That’s what the passage actually says, and what Chrysostom and Theodoret commented on. But the verse numbering causes an unnecessary break and distortion in the meaning, particularly if we read the scripture as granularly as verse-by-verse, expository teaching often leads us to. Read instead as the ancient Christians read it, Paul’s statement is not merely that we should take our anxieties to God, good as that may be. It’s that the judge of the universe is near so we can have confidence that wrong will be set right. It’s not about trying to suppress our worries and trust God, which is for many a necessary but challenging effort that contains within it many of its own worries. That’s the wrong focus. It’s about the realization that God will soon wipe away every reason for worry. It’s a reminder of our real hope. Our eyes are on the wrong thing if we’re merely praying to have life’s worrisome aspects eliminated so we can carry on stress free. Rather, we have no reason for anxiety because the judge of all the earth is already on his way. To be clear, it’s easier to write these words than live by them. But if we needed to be convinced of anything, it is not that prayer is a means to reduce our anxieties. It’s that Christ is coming. I spent a number of years attending an Assemblies of God type of church in Canada, where the AG is known as the Pentecostal Assemblies of Canada. It was also the denomination my wife grew up in. As a result — and don’t ask me why this is — she has a much better handle on parts of the Old Testament than I do. In the short time I attended a PAOC church in Toronto, most Sunday mornings we opened our Bibles to O. T. texts. And oh… what great messages they were able to derive from those texts! (My non-Pentecostal friends might say, “Where did they get that from?”) If you haven’t been exposed to Pentecostal preaching, there ain’t nothing like it. I was reminded of that today as I read this post on the blog, Thoughts for Daily Devotions. “The flood was forty days upon the earth; and the waters increased, and bare up the ark, and it was lift up above the earth” (Gen 7:17). 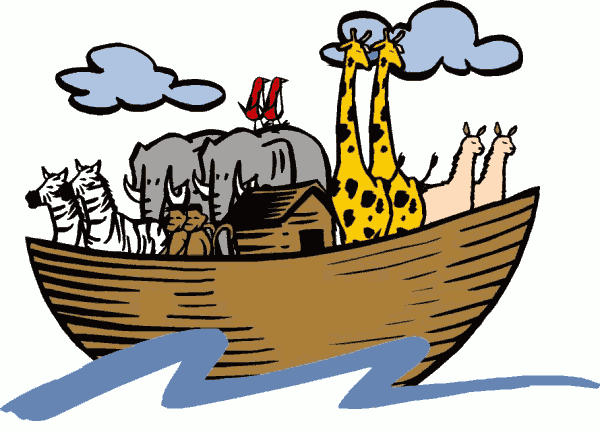 The more the ark was lifted up, the higher Noah went. Similarly, the more we lift up Christ, the more we are lifted up for the glory of God. We become the light of the world, a ‘city set on a hill’; seeing our light, men glorify the father in heaven (Matt 5:14,16). “The mountains were covered.” As we go higher in our spiritual life, the mountain-like problems that once loomed large before us, disappear from our view. Our life is now a joyful song – a song of worship, praise and adoration.